Welcome to the world-famous capital of fashion and romance! Click the search form for booking the cheapest vehicle at Paris car rental! Save on car rental with us – spend more on yourself! Now you don’t have to search for the lowest car rental prices. 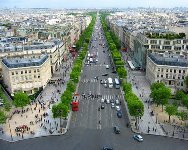 We’ll do it for you to offer the most affordable car rental Paris. Dealing only with the most reputable car rental companies in the world we guarantee cheap and reliable car rental in Paris. It’s easy - fill in the form and get the best car! 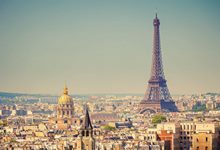 Decide on suitable Paris car rental location and don’t forget to look through Must Know and Places to Visit with car rental Paris! Paris was founded more than 2000 years ago, and then became one of the leaders among the commercial, cultural and scientific centers of the world. 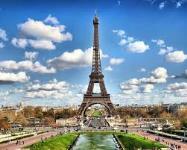 More than 25 million people visit Paris each year. The high season in Paris lasts from July to August, so it's better to visit it after these months, because at this time it is really overcrowded. Paris has more than 70 museums, monuments and cultural centers. As in every city of France in Paris you will find the street named after Victor Hugo. In this city you can go crazy over coffee and croissants, walk on architectural exhibitions and museums - or just sit on a bench in Montmartre, watching passers-by. But the best way to explore French capital is to use a car rental vehicle for your trips around the city! Paris is famous for its numerous narrow streets, or it’s better to say that all the streets are narrow there. But still lots of cars. There are no jeeps and large trucks on the roads but despite this traffic jams are everywhere. Compact cars and Smarts are great for Paris: economical, comfortable and nimble. If you would ever think to turn your car in the middle of the street to the opposite direction, you can simply raise your hand and you will be missed. There are lots of explanatory signs such as "skip the car on the right, or "turn on the lights", "turn off the lights." Fines for parking in the wrong place are huge, up to 500E. Without a doubt, the image of the Eiffel Tower is connected with Paris as no other symbol of the French capital. This is one of the most famous buildings in the world. Tour Eiffel weighs 7,300 tons has the pressure at the surface as approximately equal to the pressure on the land of a man sitting on a chair! Although it was not designed as a permanent structure. Drive your car rental vehicle to the Eiffel Tower to get to know all the interesting facts about the favorite Parisian symbol! 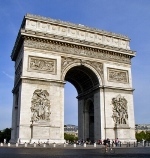 Arc de Triomphe has been completely restored. Inside it has a museum dedicated to its history. Under the arch is the tomb of the Unknown Soldier, the flame is lit every evening at 18:30. This is the best time to visit allowing to feel the atmosphere created by the Arc de Triomphe at its best. But if you want to avoid the crowds of tourists it is better to drive your car rental vehicle this site in the morning. 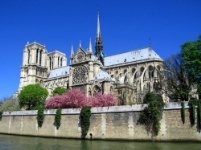 Notre Dame de Paris is not only the heart of Paris but the whole country: the distances from Paris to any other city in France are measured from the point at the far end of the square in front the cathedral where a bronze plaque marks zero kilometer. Founded in the XII century by Archbishop of Paris Maurice de Sully the cathedral has grown over the years changing with changes of the capital itself. Use your car rental vehicle to reach this legendary site! Louvre Museum (Musee du Louvre) is the world's largest palace and museum whose history goes back more than eight centuries. As the palace it does not deserve attention, the subject of interest may be only a square yard (Cour Carre). But as the museum it attracts a lot of fans of art around the world because it contains the largest collection of masterpieces ever! 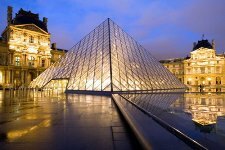 Drive your car rental vehicle to the Louvre Museum and be ready to spend a whole day there!